Other Products by Royal Hemp. Search other Vegan Protein products. Hemp seeds—technically a nut—are a rich source of multiple micro and macro nutrients, including protein, fibre, beneficial fats and minerals. Royal Hemp Protein Powder is 50 per cent protein by weight, and contains all nine of the essential amino acids that our body needs. Hemp Protein Powder also has plentiful amounts of an amino acid called arginine. Though this amino acid is not essential for survival, given that our body can synthesise it, it is considered important for optimal health. Arginine has many benefits attributed to it, such as supporting the production of nitric oxide, which is important for regulating peripheral circulation and blood pressure. Furthermore, arginine has been shown to reduce fasting blood sugar, triglycerides and LDL cholesterol, compared to placebo1. Though these studies have used pure arginine, and hemp protein powder does contain a wide range of other supportive amino acids that may compete with arginine for absorption, we can still expect some of these benefits to shine through. Hemp protein is a rich source of essential, and some other rare and specialised, fatty acids. The essential fatty acids are linolenic acid (Omega 3) and linoleic acid (Omega 6). Again, the term essential tells us that we need to consume it through diet or supplements. However, most westerners tend to consume a diet too rich in omega 6 fatty acids, and low in Omega 3s, creating an imbalance in the proportion of these fatty acids. This creates an unfavourably high Omega 6 to 3 ratio. It is a boon, therefore, to have available a protein powder than can deliver a significant quantity of Omega 3 fatty acids. The fatty acid benefits of hemp protein don’t stop there, however. This miraculous food source is also rich in conjugated linoleic acid (CLA), which may assist in improving body composition2. Additionally, gamma-linolenic acid (GLA) function as an anti- inflammatory nutrient3. 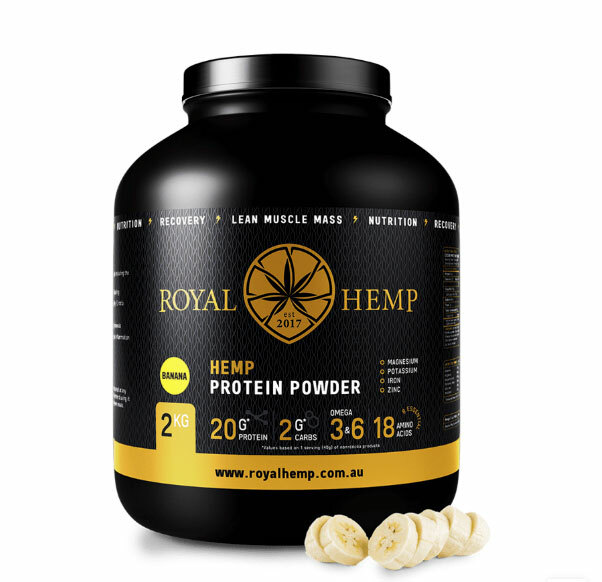 Royal Hemp Protein Powder is not only a high quality vegan protein powder, but also delivers other important nutrients, including arginine, essential and other fatty acids, minerals and a high quantity of arginine. It is a fantastic addition to any smoothie or protein shake. Mix 1 scoop with 400ml water or liquid of your choice and shake well. INGREDIENTS: Certified Organic Hemp Protein Powder, Flavour (natural and nature-identical), Sucralose.